The winter holidays call us to remember… those who are no longer at the table with us… the traditions of our ancestors… a time when our prayers were known to be needed to persuade the return of the light. 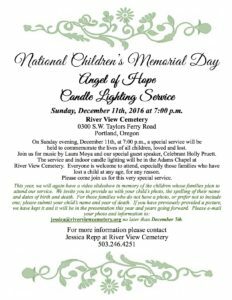 A ceremony to honor the grief of families whose children have died, and the memories of those children. River View Cemetery Chapel, 7pm. Free, no registration required. Optional submission of photo by Dec. 5. Download a flyer. Come together for a period of silent meditation, quiet music, and rituals of remembrance, bereavement, and farewell, followed by a simple supper. You are encouraged to bring pictures or mementos of persons you wish to honor or remember. Offered by Holly Pruett, Life-Cycle Celebrant & Home Funeral Guide; Don Tarbutton, retired Hospice Chaplain; Harp: Sylvia Hackathon, CM-Th. Pine Street Sangha, 5:30-7pm. There is no cost to attend, contributions are appreciated. Space is limited, registration required via Eventbrite.